It's not a long day today, but I've got to go back over the mountains again as I'm in the Massif Central, the great bulk of higher ground in the south of France. But hopefully if I take it easy I should be OK. I start off thinking my leg's better, but quickly it's back to how I ended up yesterday, ie painful and pretty useless. It's a beautiful morning ride nonetheless, through the Vallée L'Allagnon to Massiac, it's a beautiful, peaceful and winding route. 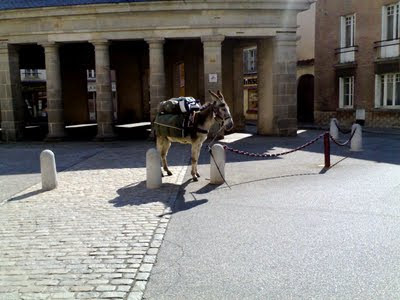 At Massiac I spot another traveller with a well-loaded donkey! 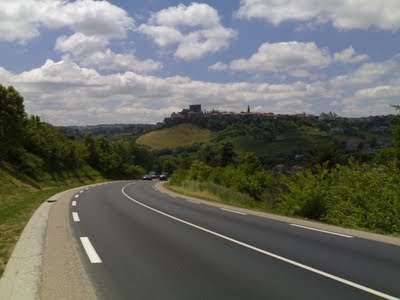 After having late morning coffee the Massif Central proper starts and I have to cycle uphill for 10 miles. I'm genuinely starting to worry that I won't be able to finish at this rate. Get to lunch an hour late at Saint Fleur, but it was a lovely long hill down at nearly 40 mph (breaking the speed limit on the way). Obviously after lunch I have to cycle up and down to the plateau twice, each time it's about a few hundred metres up and down! I meet a local cyclist who looks like he's in his 70s and explain that I'm going to Marvejols, 'Tres dur' (very hard) he says which is a bit off-putting. After that it is almost constantly uphill, past Alpine-like meadows. But just as I think I won't be able to manage the last 10 miles uphill to Marvejols, I reach the sign for the peak and it's all downhill – for 15 minutes. Stopping into the town I treat myself to a beer and, boy, does it taste good after today!